Immerse yourself with Guatemala’s fascinating history and beautiful scenery on this 6-day tour. See some of Guatemala’s best-known destinations as you take a city sightseeing tour around Antigua and Guatemala City to see the processions. Also enjoy a boat ride on Lake Atitlán, visit the Mayan ruins of Tikal and mainly be witness of the Holy Week Celebration in Antigua and Guatemala City. We invite you to see the traditions and feel the fervor of all people during this special celebration in Guatemala. Reception at La Aurora International Airport and transfer to your hotel in Guatemala City. Leaving early in the morning we will catch a flight to Flores, Petén, to visit the Mayan ruin of Tikal National Park. Explore everything from the Central Acropolis, a maze of courtyards and small temples, to Complex Q and R, where you'll see twin pyramid complexes with altars set in front of the temples. Visit the massive Temple I and the Temple of the Grand Jaguar. Time for lunch. Take a lunch break at the park before continuing your exploration of the national park. In the afternoon you will take the flight back to Guatemala City. After breakfast, you will be part of a special activity in Antigua by helping to make an “Alfombra” or carpet that are elaborated with flowers and sawdust (aserrín) of many colors and with other materials. You will see how the procession pass over it. Then we will continue to visit Guatemala City for a panoramic view and also enjoy of the processions of Jueves Santo.In the afternoon transportation back to Antigua. After breakfast, explore the charming colonial city of Antigua on foot with your guide. 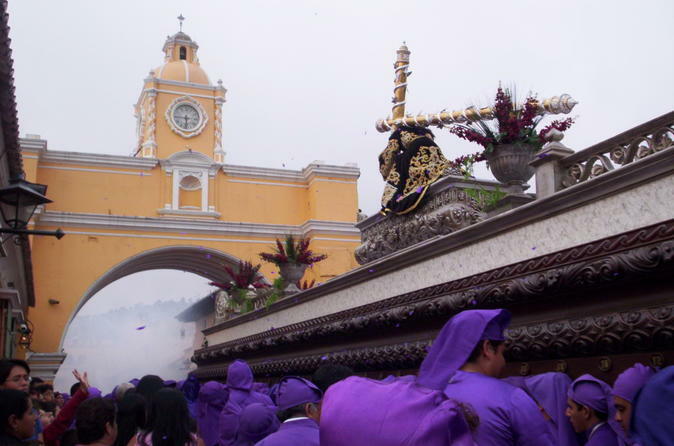 You will appreciate the “Santo Entierro” procession in Antigua and it’s the biggest procession of the week. During this day you will see the Andas (Floats) that are usually very large. They are made of wood and they carry handles on either side for the cucuruchos to lift. These are just the bases however, the real art takes place on top. The Cucuruchos are the men who carry Semana Santa floats. In the morning of Good Friday, the headdresses used are white. Then, from Friday afternoon, everyone switches to black robes and headdresses to symbolize mourning. After breakfast enjoy a beautiful private sightseeing cruise across the lake to the Tzutujil village of Santiago de Atitlán. You'll have time to stop for lunch (own expense) in Panajachel. In the afternoon transportation back to Antigua. After your amazing tour, transportation to the Airport to take the flight back to your country or to your next destination.